Did you know oatmeal is good for your health? A bowl of oatmeal a day can lower your blood cholesterol, its high content of complex carbohydrates and water-soluble fibre encourages slow digestion and it is also high in B vitamins. Oats are also very good for your nails & hair. The most commonly used oats today are rolled oats, which are quick to cook. 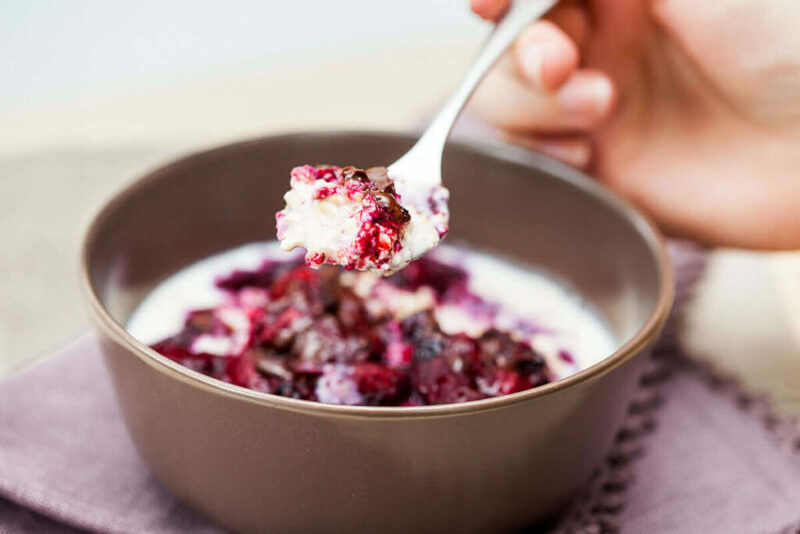 One of the easiest ways to make oatmeal for breakfast is the overnight oatmeal version – you put your rolled oats in a container and pour over any kind of liquid you like – milk or non-dairy milk work best, but you can also use yoghurt, juice or water, depending on taste. Then you stir well, close the container and refrigerate overnight. In the morning, you can just open the container, add a topping of choice and enjoy, or you can also warm it up. What can be easier than that? A healthy breakfast served with minimum effort. I find a bowl of oatmeal fills me up the most and can last me well into lunch time. I like to top it with berries, that I simply keep in the freezer. In the morning, I put a handful of berries in a pot, heat it up and mash the berries slightly. Then I pour it over the oatmeal and perhaps add a dash of dark chocolate, as pictured above. Oh, my. I might go make myself another bowl. 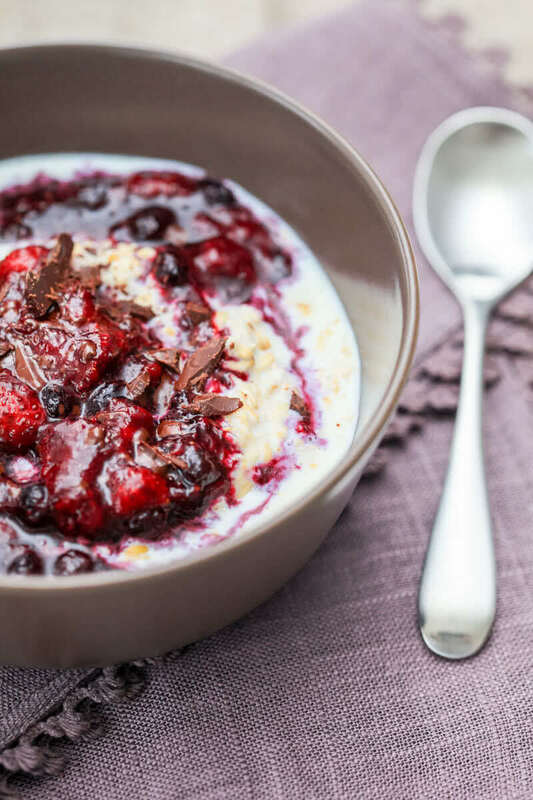 Overnight oatmeal is also great for a breakfast on the go. As your oatmeal already is in a container, you can simply put it in your purse and off you go to enjoy your breakfast in the office. This dish is vegetarian. Use non-dairy milk such as soy or almond milk for a vegan-friendly version. Also suitable for omnivores. In fact, I highly recommend it. Enjoy! Put rolled oats into a container and add milk. Close the container and shake well. Refrigerate over night. In the morning, pour your oatmeal out of the container and into a bowl. If needed, add more milk or other liquid. Place your berries in a pan and sprinkle with sugar. Heat up to medium and stir constantly until the berries start to liquify (just a couple of minutes). You can help the process by mashing them lightly. If you use frozne berries, it is going to take a bit more for the berries to thaw. 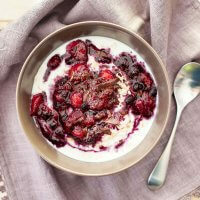 Pour your berry mixture over the oatmeal and top with chopped dark chocolate.